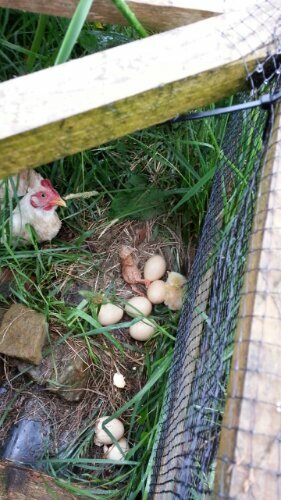 Soon after moving in we had spotted 7 eggs in an old chicken run with a hen sitting on them most of the time. My first reaction was to ignore it as we were busy with the move and didn’t want to face up to the likely consequences. Besides I thought I had 3 weeks or more before I needed to worry about any eggs hatching so I could comfortably put off making any decision really. Apparently having decided to leave the eggs where they were, the rest of the decision was not one for me to make anyway. Eventually a couple of the eggs hatched last Sunday (despite my scepticism) so I was obviously wrong to prejudge natures abilities. With no intervention on our part everything has so far gone exactly as we should have realised it would. Hopefully our beginners attempts at helping things along in the future will not cause any problems. 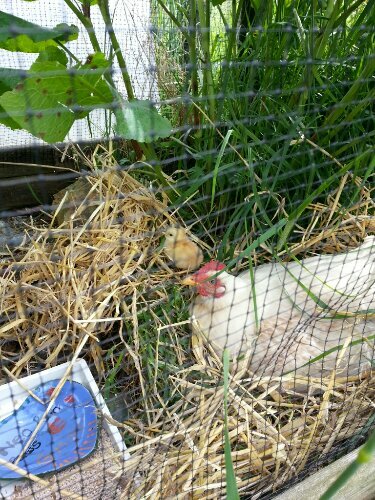 This picture shows one healthy looking chick and one which we initially thought wasn’t looking so good but which we eventually realised must have only recently hatched. Luckily I spotted that it was breathing rather than immediately removing it in order to keep the nest area free of any dead ones. The best starter food for newly hatched chicks is hard boiled eggs well mashed down, we keep our chicks on this for the first week and then gradually start adding chick crumb.